Drum Corps International is very excited to once again present our World Championships in Indianapolis, Ind. from Aug. 12-14, 2010. 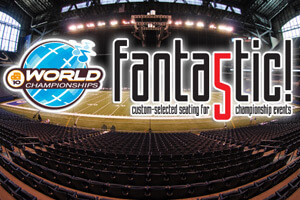 FANtastic 5 tickets will give you access to all five Open and World Class Championship events taking place at Lucas Oil Stadium in one convenient package, but your opportunity to enjoy every second of the action from these incredible seats is quickly coming to an end! Your opportunity to grab the "best seats in the house" is quickly coming to an end. All order forms must be postmarked by Nov. 1, 2009. Learn more, and order today!